bebopified: Movie reviews: "Ride Rise Roar," "Shadow Play: The Making of Anton Corbijn," "Charlie Haden: Rambling Boy"
Movie reviews: "Ride Rise Roar," "Shadow Play: The Making of Anton Corbijn," "Charlie Haden: Rambling Boy"
Each fall, the Sound Unseen festival brings movies about music to Minneapolis. I would go to every film in the series if I could. This year, their 11th, I would have liked to see The Agony and Ecstasy of Phil Spector, The Carter (a documentary about Lil' Wayne), and Do It Again, about a Kinks fan's efforts to bring the band back together again. What I saw: Ride Rise Roar, a David Byrne concert film directed by David Hillman Curtis; Shadow Play: The Making of Anton Corbijn, directed by Josh Whiteman; and Charlie Haden: Rambling Boy, a documentary film by Reto Caduff about the great jazz bassist. This year, the Southern Theater was a sponsor of the festival, and also a site where screenings were held. Music programming director Kate Nordstrum planned something extra for people who came to see Ride Rise Roar. She flew Steven Reker in from Florida for a live performance before the film. Reker is a dancer in the film, and a musician; he sang a few of his own compositions for us, playing guitar, laptop, and a tiny keyboard, and ended with a winsome take on the Carpenters' "Yesterday Once More." Reker is charming and engaging; seated, playing his music, he moved his legs and feet as if he'd rather be dancing. When he forgot to turn on the reverb, he exclaimed "What a mess!" After the movie, he stuck around for a Q-and-A during which he told stories about traveling with Byrne and performing some 200 live shows per year during the tour. He says he's done with dance now, and it's all about music; he has a date at The Kitchen in NYC. His presence added a personal touch to the experience of watching the film, in which he figures prominently as one of the three dancers. Ride Rise Roar is a riveting concert film, musically and visually. Everyone wears white. Dance—modern dance, choreographed by Anne-B Parson and Noemie LaFrance—transforms the experience from just another concert (albeit a concert by David Byrne) to something more dynamic and artsy. (Having just seen Reker live and knowing he was in the house made it especially enjoyable to watch him on screen.) At one point, the band's keyboard player talks about how the presence of the dancers affected him. 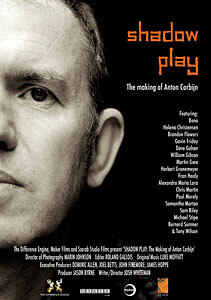 He found himself playing along with their movements, imagining he was scoring a film. The music includes many of the songs we all came to hear—"Once in a Lifetime," "Burning Down the House," "Life During Wartime," "Heaven"—and new collaborations by Byrne and Brian Eno. (Not, alas, "Psycho Killer" or "Take Me to the River.") Byrne dances. Even the backup singers dance—reluctantly at first (when they signed on, they didn't expect this) but then they get into it. At one point, everyone wears gauzy white tutus and it's glorious. Corbijn is the Dutch photographer who defined the look of rock bands including U2, Depeche Mode, and Nirvana (although Kurt Cobain claimed that everything Corbijn did for Nirvana was his idea). We've all seen Corbijn's iconic shots of Bob Dylan and Springsteen, watched his music videos (he's made over 80), and studied many of his 100 or so album/CD covers (example: U2's The Joshua Tree). He directed the film Control (2007), about the band Joy Division, which won awards at Cannes, and also the feature film The American (2010) starring George Clooney, which has gotten mixed reviews (and a 64% rating to date on the Tomatometer). Shadow Play is an interesting film, but we learn very little about Corbijn as a person, except for the fact that he grew up in Holland and his father was a minister. Perhaps the most revealing part of the film comes near the end, when he dresses up as many of the rock stars he has photographed over the decades and films himself. But it's fascinating to see how Corbijn's eye and camera—and his unlimited access to musicians—transformed them from awkward, badly-dressed boys to brooding, charismatic superstars, most often in black-and-white. Worth seeing if you're into photography and rock-and-roll. The film screened at the Red Stag Supper Club, another festival sponsor. That seemed like a good idea but turned out not so much. The Red Stag is a popular spot and it was full of regular customers, talking and eating and drinking and hanging out. Dishes clattered in the background, glasses clinked, pots and pants clanged, plus there was something wrong with the projector; the film kept stopping and sticking, as if it were being streamed on a bad wireless connection. Still, those who had paid to see the film were mellow. The stopping/sticking was annoying but no one yelled or left. Afterward, a Sound Unseen representative apologized profusely and promised to send us free tickets to another theater in town (the Trylon Microcinema). I previewed this film for MinnPost after seeing it on my Mac. 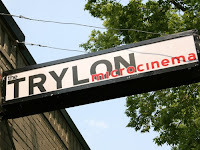 It was a thousand times better on the big screen at the Trylon Microcinema. I still think it's too reverent (especially the ending, where the strings swell up), but maybe bassist Haden is as wonderful a human being as everyone in the film says he is? My mind is boggled by the scope of his accomplishments: singing harmonies with his mother as a baby, performing on his family's country-and-western radio show, joining up with Ornette Coleman (and revolutionizing jazz), playing with Keith Jarrett, John Coltrane, Hank Jones, Pat Metheny, et cetera ad infinitum, forming his own big band, the Liberation Music Orchestra, with Carla Bley, leading Quartet West, teaming with musicians around the world. At one point in the film, Bley notes, "I don't think it's about music at all. Music is just the way he talks to people. There's a lot of bass players who can play faster and louder and longer and all of that, but everyone accepts that the feeling he gets out of one note is worth more than a hundred of another bass player's notes." 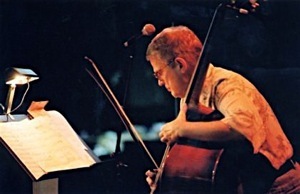 Charlie Haden: Rambling Boy is the story of Haden's life from his childhood to the present day. If you don't know him, it's a good introduction to the man and his music; if you do, it will deepen your appreciation of his contributions. He does appear to be a warm and gracious person. That was my experience when I interviewed him a few years ago. He was my first big national interview and I was scared to death. He immediately put me at ease, and he called me "Man." He calls everyone "Man." If you see the film, watch for the part where Haden and a woman carrying his bass (his luthier) walk into Haden's home. Someone passes through the room just long enough for the camera to catch him. It's Ethan Iverson. This was my first visit to the Trylon and I loved it. You enter through a big, open space with paintings of flying saucers on the walls and make your way to a small, dark room with 50 seats--cushy, rocker-back cinema seats. It's intimate and comfy, and the sound is amazing. KBEM is now screening its REEL Jazz film series there.